How on earth am I on #39?? That’s gone so quick! I’ve really enjoyed posting my updates each week & sharing handy tips… I did however break my weekly streak of posting every Wednesday last week 😦 Socialising & work got the better of me! Just a reminder… It’s “Santa’s coming to town” by Lizzie Kate on linen fabric. My first Lizzie Kate chart & I’m loving it! But yes, very busy with work & actual plans that don’t involve sitting at home & stitching 😦 but there you have it. I’ve been trying to keep up with all your lovely Cross stitch updates… How is everyone getting on? 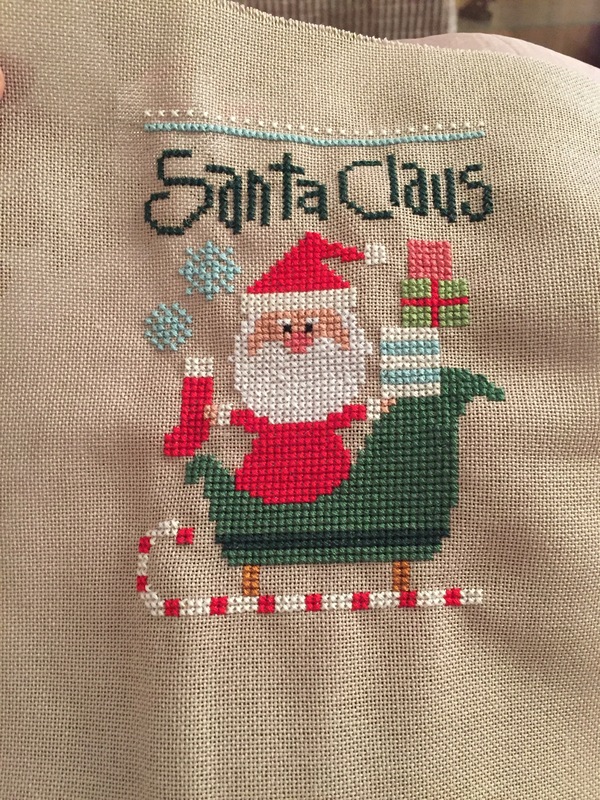 Is it time to put your Xmas stitching away yet? I’m really hoping to get this little one done before Christmas so I can frame it & have it displayed for a week or two but I won’t hold my breath! I do still need to buy the little embellishment pack with the little buttons in. I hope this post finds you all well…Have a great week stitching guys! I used to give myself deadlines to post, but it was too stressful. So now I post when I can. Much easier 😉 Love your Santa stitch.